I finally finished my first qualifying exam last week! If you’ve noticed a dearth of posts, it’s partially because I was frantically typing away, and, if it weren’t for The Boyfriend making me coffee, tea, and TGIFridays Potato Skins every few hours, I probably would have forgotten to eat. A trip out of the city was just what the Dr. ordered. We drove out to Mattituck, Long Island with some friends, and I had my very first berry-picking experience at Patty’s Berries and Bunches. 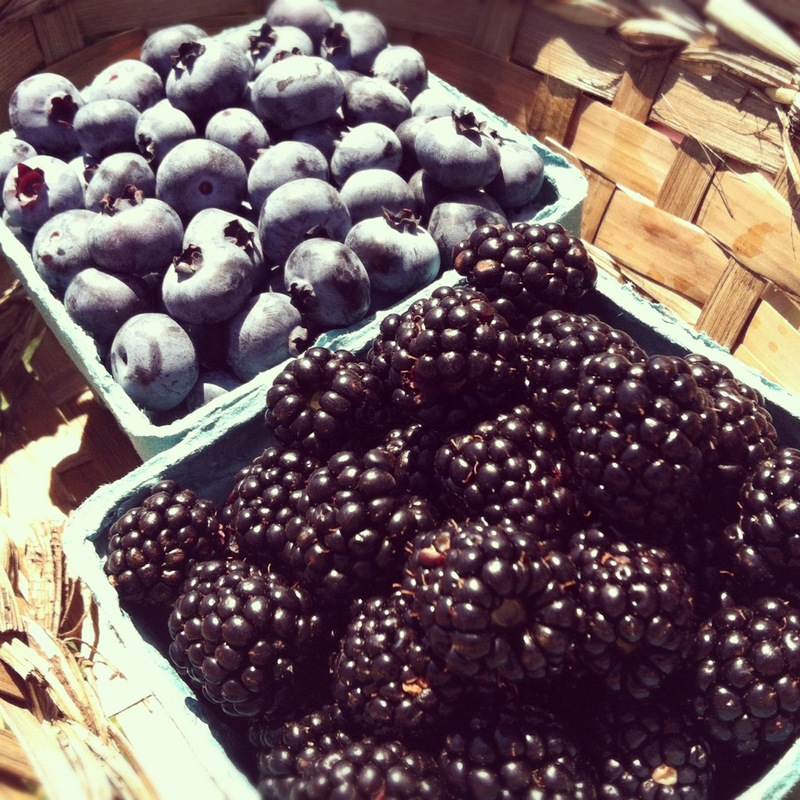 It being late July, it was prime time for blueberries, and there were even some blackberries ripe for the picking. Of course, I couldn’t resist sampling a few of each as we went along. The blackberries were some of the sweetest I’ve had, and some of the blueberries were downright huge, not to mention juicy. 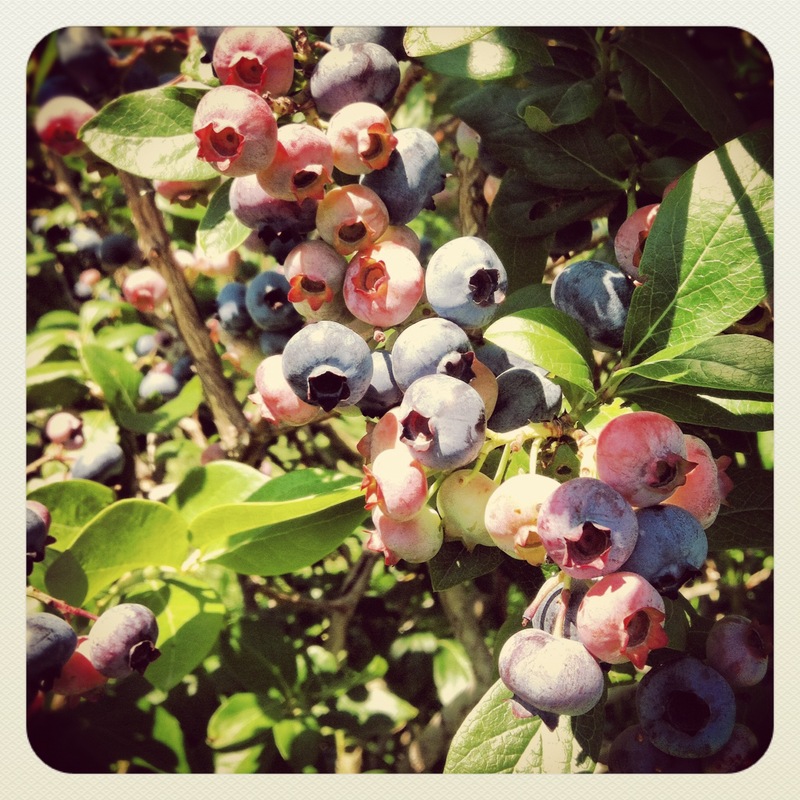 They were so good, in fact, that I picked extra so that I would have enough to make Blueberry Cobbler and Blueberry Muffins, neither of which I had attempted before, but how could you go wrong with fresh blueberries picked right from the bush? I was especially pleased with the Blueberry Cobbler. 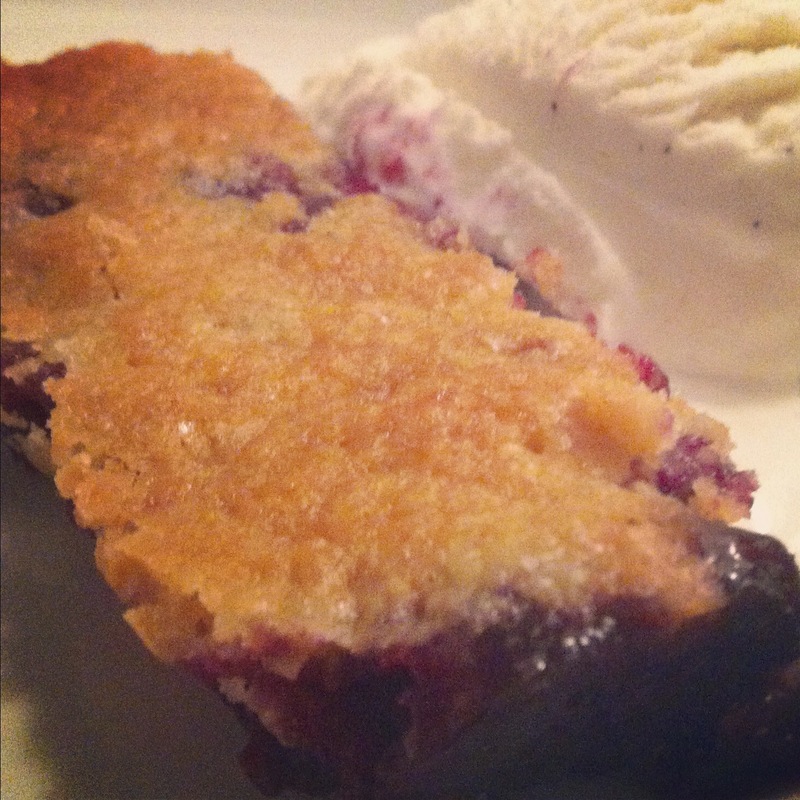 The berries were tart and sweet, and went nicely with the buttery crust. (Jeff asked me what the “filling” was made of–ha! Just fresh fruit and some sugar, plain and simple.) A scoop of vanilla ice cream was the perfect finishing touch for this classic summer dessert. Definitely serve warm, or immediately after baking if possible. 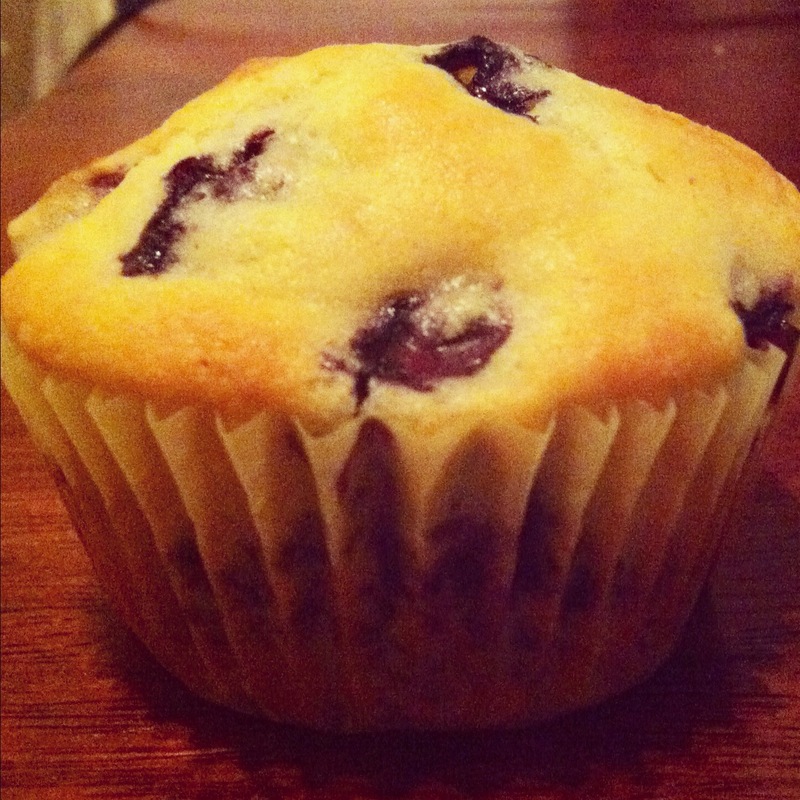 The muffins turned out well too, and, as you might predict, the fresh blueberries were the stars of that show too. These came out moist and a little hearty (probably on account of the substitution of cornmeal for some of the flour), making these muffins ideal for a light breakfast. I still have some blueberries (and quite a few blackberries) left over, so I may try to make something else, but something tells me I might need to go back to Patty’s for a refill. 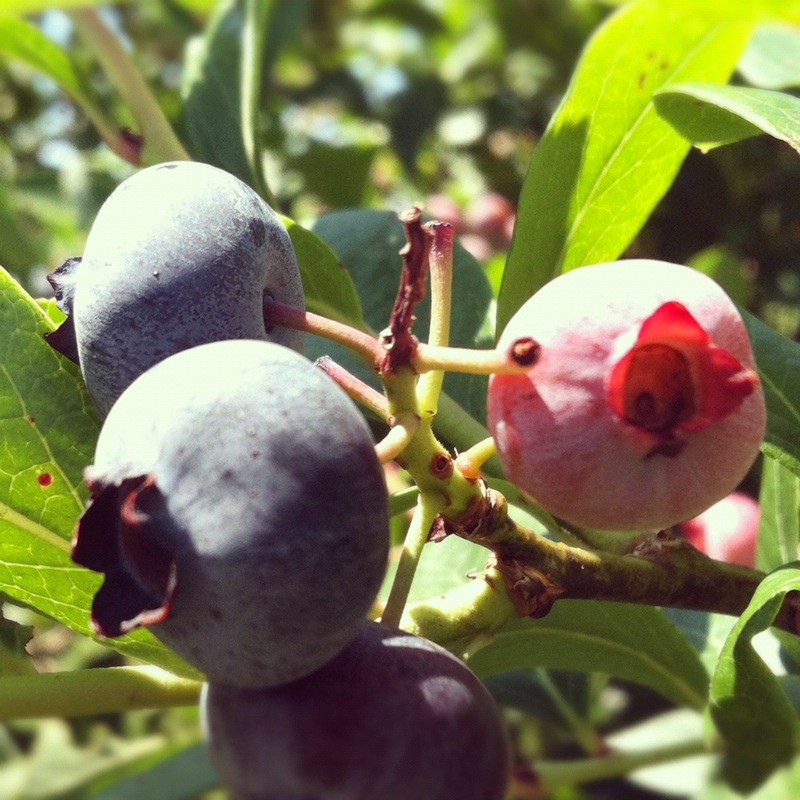 What’s your favorite blueberry treat? Feel free to sound off in the comments! One of the most valuable pieces of advice that I have for fellow novice cooks is this: Unless you are working in the sparkly, magical kitchens in cooking-show land, things will inevitably go wrong. Your eggs could go bad. You could run out of spices. You could mistake baking powder for baking soda, or vice versa. Or, you could use a springform pan instead of a regular cake pan, almost set your apartment on fire, stub your toe, and scare your cat into hiding for three days. Preheat your oven to 375 degrees, and line the bottom of your buttered 8 BY 2 INCH CAKE PAN (figure I couldn’t emphasize it enough!) with parchment paper. Pour 2 tablespoons melted butter into the pan, and spread evenly. Sprinkle 1/2 cup of packed, light brown sugar over the butter. 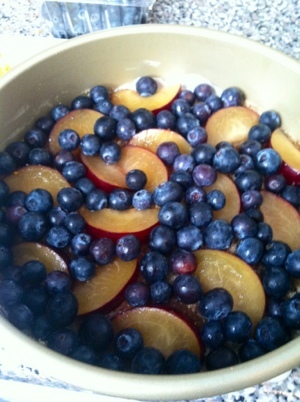 Finally, add the plum slices, and use the blueberries to fill in the gaps–I may have overdone it with the blueberries myself, but the top came out tart and sweet, almost like an old fashioned jam. Transfer your batter (butter, brown sugar, eggs, egg whites, orange zest, flour, poppy seeds [I omitted these], baking powder, baking soda, salt, buttermilk [I found reduced fat in my supermarket! 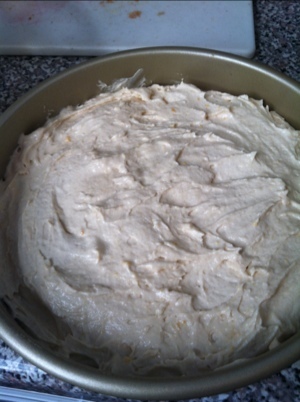 ], vanilla extract) to the cake pan. 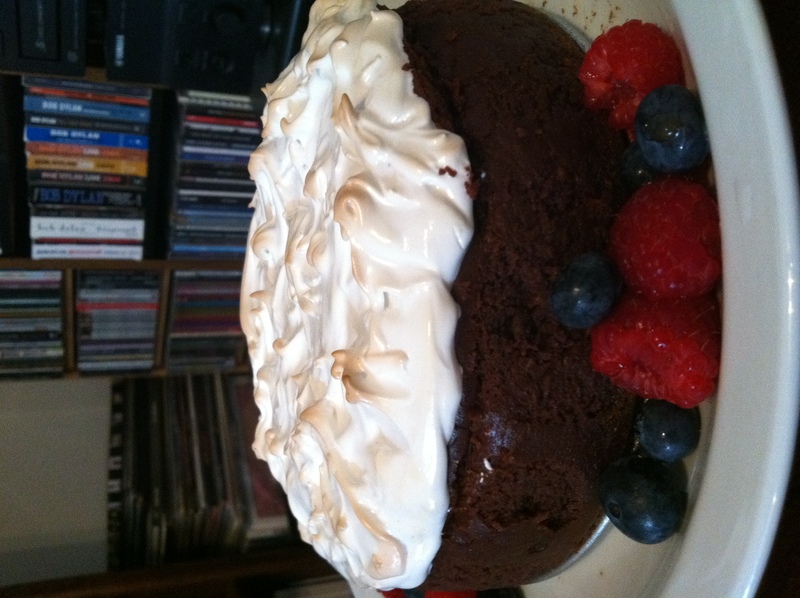 Smooth the top and make sure there are no air bubbles. Bake for about 45 minutes, or until cake is golden brown and passes the toothpick test. Watch this one like a hawk–burned fruit is not a good look, trust me. 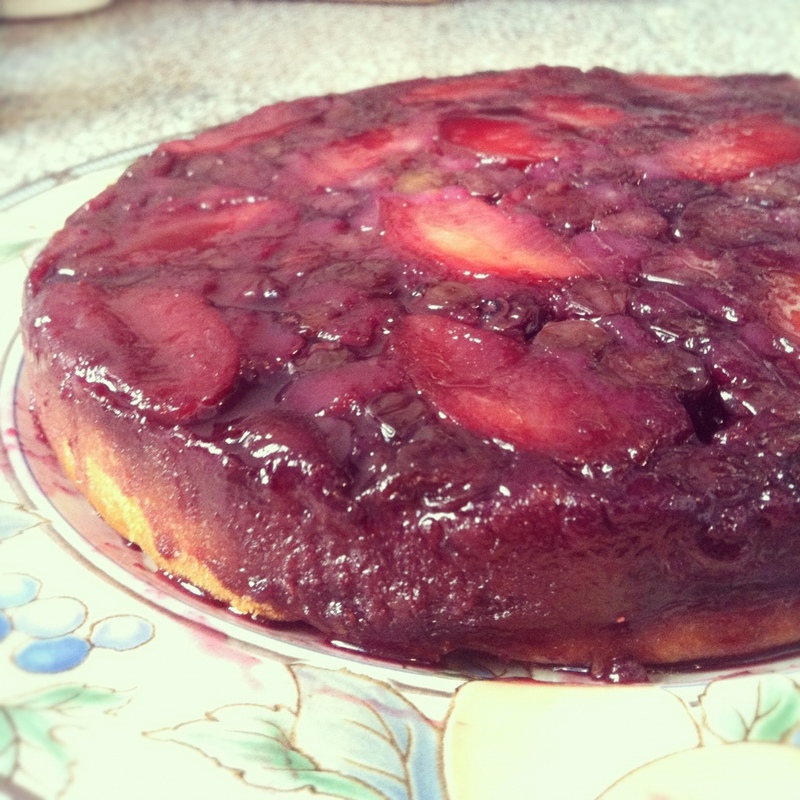 Wait until after it cools to invert, and then serve warm or at room temperature. If you’re a fellow coffee drinker, you probably know that an iced coffee generally costs more than a regular hot coffee. But, on those hot summer workdays, sometimes nothing else will do. The good news is, after searching high and low, I found a recipe for iced coffee that actually works–in fact, I think it’s actually better than store-bought. It does require some forethought and planning, but it’s surprisingly easy and well worth the extra five minutes in the morning. It definitely got me through a very busy summer at work last year. Stir together coffee and 1 1/2 cups water. The Times suggests to cover and let it rest at room temperature overnight or 12 hours, but I like to put mine in the fridge. It keeps it safe from the cat and I think it yields a slightly stronger flavor. I also use a Pyrex measuring cup instead of a jar or glass for an easy pour the next morning. Strain twice–I use a tiny hand-held strainer that works like a charm. 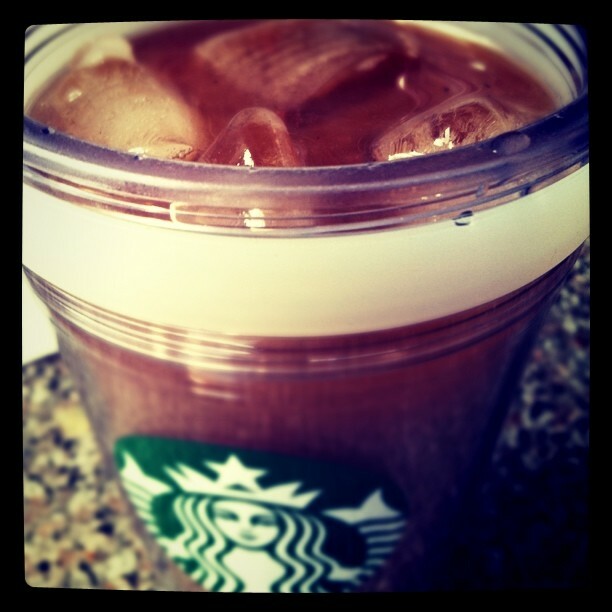 Place some ice cubes in a tall glass, and then mix equal parts coffee concentrate and water, or adjust to taste. Remember to leave room for milk if you usually take it in your coffee. It might take a couple of tries and playing around with the measurements to get the exact flavor and strength that you want, but once you get it right, you’ll never go back to buying iced coffee. Enjoy!